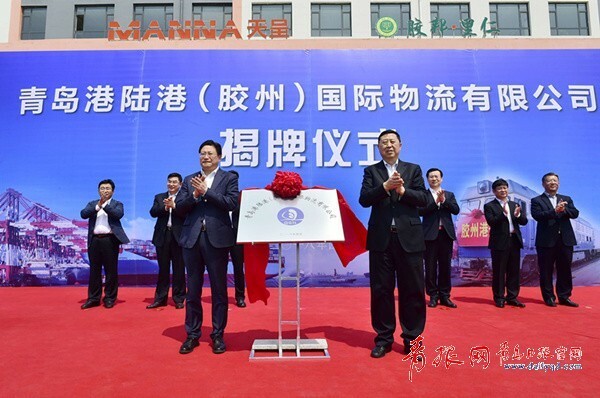 Qingdao Port Land Port (Jiaozhou) International Logistics Co Ltd was formally established on April 28, which marks deepening cooperation between Jiaozhou (a county-level city of Qingdao) and the Qingdao Port, an important measure for both to implement the Belt and Road Initiative. At present, the logistics company has eight functions of multimodal transport, bills of lading sign and issue, site operations, warehousing and distribution, inspection for fumigation, booking agency, international trade, and impawning supervision, which integrate Jiaozhou's geographical advantages to provide local companies with one-stop import and export logistics services. In recent years, Qingdao Port has vigorously implemented the multimodal transport development and inland port construction strategy. The number of sea-rail combined transport containers has ranked first in the nation's coastal ports for three consecutive years. Qingdao Port has cooperated with many cities to establish a number of inland ports, effectively reducing the transportation costs of local import and export companies and driving local economic development.